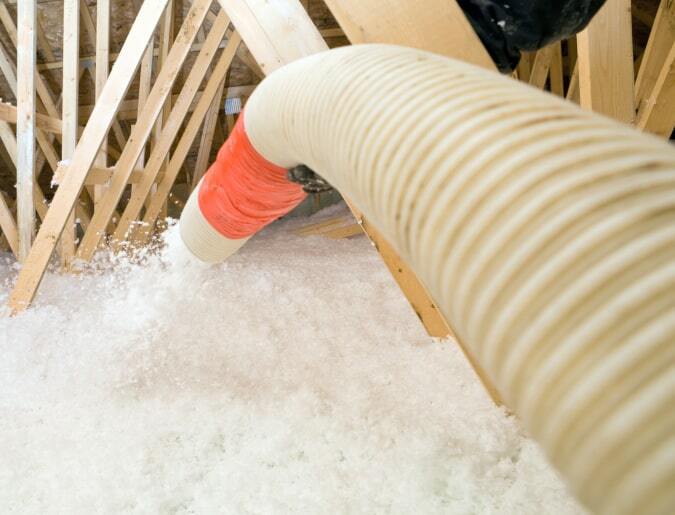 Fiberglass vs. Cellulose Insulation: Does it Really Matter? In most houses around Atlanta, the choice of insulation material comes down to fiberglass vs. cellulose. Fiberglass is the most common. Cellulose is the second most common. Both types of insulation can, you know… insulate. But which one should you pick? Any insulation is better than no insulation. First things first. If you’ve got bare, uninsulated areas on the floor of your attic, getting some kind of insulation in there is a must. Whether you pick fiberglass or cellulose, choosing to insulate at all will be the best choice you make. With that out of the way, let’s address the question from the title of this article. In terms of performance, it mostly does not matter whether your insulation is made from fiberglass or cellulose. What does matter is the type of fiberglass or cellulose – and how well it was installed. A given sample of cellulose insulation will provide better thermal performance than an identically sized sample of fiberglass insulation. Per square inch of insulation, cellulose has a higher R-value than fiberglass. What’s R-value? It’s a measurement of an insulation’s ability to block the movement of heat. The higher the R-value, the more insulative the material. Higher number = better performance. With loose fill cellulose insulation, you can achieve an R-value of 3.2 to 3.8 per square inch. Loose fill fiberglass, by comparison, provides an R-value of 2.2 to 2.7 per square inch. Does that mean you should always just go with cellulose insulation because you can use less of it to achieve the same total R-value? Well… not necessarily. According to the International Energy Conservation Code, attics in our area should be insulated to R-38, but very few older homes have that much insulation. To hit code minimums, you’ve got to add new insulation on top of the old insulation. Assuming your current attic insulation is made from fiberglass and has a value of R-13, you’d have to add roughly 10 inches of additional fiberglass to hit R-38. Or 7 inches of cellulose. You can get to the same place with either material. Depending on the contractor and their suppliers, one material may be more affordable than the other – even when you need to buy more of it! What’s more, you only need to insulate up to a point. After about R-40, adding more insulation has very little effect in our climate zone. It’s the law of diminishing returns. If R-40 is like being a billionaire, R-100 is like being a multi-billionaire. The number may be bigger, but you’ve got plenty of money either way. Cellulose can get you to R-40. So can fiberglass… if you blow a little more of it on top. Isn’t fiberglass cheaper than cellulose? Costs depend on your insulation contractor, their suppliers, and market conditions. At this writing, our suppliers currently offer cellulose for less than fiberglass. That might not be the case with all insulation contractors, though. And it might not be the case with us all the time either. You’ll just have to compare quotes. If one insulation material ends up being less expensive than the other, the price difference can range from negligible to dramatic. Simply put, it just depends. Costs aside, you might (as we’ll soon see!) still prefer cellulose or fiberglass for other reasons. There are two ways to get your insulation, whether fiberglass or cellulose: batts or loose fill. Sometimes, loose fill insulation is referred to as “blown in” insulation because an installer literally blows it into your home with a special machine. It comes in rolls and has paper backing on one side. You’ve probably got batts in your attic, walls, and crawlspace right now! Fiberglass is, by far, the most common type of insulation sold in batt form, although cellulose batts do exist. Installation difficulty: You’ve got to cut fiberglass batts to fit a space perfectly. Failure to do so results in an area that is poorly insulated – or even uninsulated. Margin of error: There isn’t one. If, for example, you don’t insulate the last three inches above the bottom of the framing inside a wall cavity because an insulation batt doesn’t reach that far, you’ve got a problem. That wall cavity won’t be very insulated at all. Even the insulation you did install won’t be able to block heat as well as it ought to with a gap at the bottom. Breaks in the thermal barrier: Because batt insulation is so hard to install properly, batts are rarely result in consistent, continuous insulation levels. Basically, your home will have breaks in the thermal barrier. You’ll have hot spots and cold spots throughout your home. You’ll be less comfortable. Sadly, batt insulation is often installed improperly. Whether it’s bunched up, jammed in, torn, sagging, lifted, or simply missing, few contractors get it right. Loose fill insulation is just better. From the speed and ease of installation to the virtual impossibility of installing it wrong (assuming you’re experienced), loose fill fiberglass or cellulose is usually more effective than batt insulation. When you install loose fill insulation, it’s hard to miss a spot the way you might with batt insulation. As you blow the insulation into a space, the loose pieces fill every gap and crack. Getting the insulation where it needs to be is much easier and more precise than meticulously cutting batts to size, making mistakes, and re-cutting. With loose fill insulation, it’s relatively simple to hit a target R-value, such as R-40 for your attic, just by blowing in more insulation. You don’t have to unroll more batts, measure them, cut them, and lay them down. Loose fill insulation is also a good choice for uninsulated wall cavities. Using a “drill and fill” procedure, you can blow the insulation through a hole drilled into the wall near the top of each cavity. Compared to batt insulation it’s just an all around more versatile product. Which insulation material is better for the environment? Probably cellulose. But fiberglass isn’t as bad as you might think. Cellulose is made from recycled newspapers – about 80% of any given sample of cellulose insulation consists of nothing more than straight-up paper. Other than that, the only other thing in cellulose is a fire retardant and insect repellant. Some manufacturers add additional chemicals for binding the materials together. Fiberglass is made from sand and glass. Sand, of course, is a natural resource, so the raw materials inside fiberglass come directly from the earth. However, according to the Department of the Interior, the three largest US fiberglass manufacturers make their insulation from 20% recycled glass. Yep! That fluffy pink stuff in your attic might have some old beer bottles in it. The bottom line? Cellulose is made mostly from recycled material and fiberglass is made mostly from natural resources dug from the ground. Keep that in mind if you’re keen on making the an environmentally conscious choice. And remember, any insulation is a win for the environment since it reduces your AC and furnace use. Both types of insulation have potential hazards. But don’t worry. You’re not in any danger. Neither are the many millions of other families with fiberglass and cellulose insulation in their homes. Both types of insulation can hold moisture. You see this most often in crawlspaces where fiberglass batts have been installed in the floor cavities. As humidity inside the crawlspace saturates the insulation, batts begin to sag and hang from below your floor. Eventually, some of them might even fall down. The solution to this problem, by the way, is to encapsulate your crawlspace. This hazard can be particularly messy when you’ve got a roof leak. In addition to plugging the leak and repairing damaged sheetrock, you’ll have to replace the insulation that got wet. Depending on the nature of the leak, the insulation – fiberglass or cellulose – might be a sopping, moldy mess. At least one study concludes that cellulose retains less moisture than fiberglass. But remember, cellulose is paper. There’s a reason why they double-bag your newspaper on rainy mornings! Fiberglass, as you may have experienced, can also make you itchy. Whether batts or loose fill, little pieces of spun glass can become embedded in your skin. It’s usually not enough to cut you, but it’s enough to make you itch for several days. That’s why it’s a good idea to wear long sleeves when installing fiberglass insulation. Got a dust mask? You’ll need to wear one any time you work with (or risk disturbing) fiberglass insulation. While the National Academy of Sciences has concluded that fiberglass is not a human carcinogen, it’s still known to irritate the nose and throat. You’re simply better off not inhaling little glass fibers. According to research by the National Institute for Occupational Safety and Health (NIOSH), dust from dry cellulose insulation can also be hazardous. Installers are advised to wear respirators when working with it. If you’ve ever emptied out a paper shredder, this recommendation probably comes as no surprise. Should you be worried about any of this? There’s no insulation in your living space. That means you won’t be breathing it in or touching it. You probably won’t be installing it. If you hire a professional installer, they’ll have to take all the safety precautions to prevent harmful exposure – not you. When you have to, it’s easy to take precautions. Going into your attic or crawlspace? Don a dust mask and avoid kicking the insulation around. You’ll be fine! As long as you avoid disturbing your insulation and/or breathing in the insulation dust, you should be a-ok. If you do touch your insulation or accidentally inhale some of the dust, the latest research suggests that any negative effects will be short-term and minor. After all, you’ve probably experienced “insulation itch” before. And it went away. Whether you choose fiberglass or cellulose, your insulation will only block the movement of heat. It won’t block the movement of air – and that matters. In a typical home, air infiltration is endemic. Outdoor air is constantly entering your home through gaps and cracks in the building envelope. At the same time, conditioned air is leaking out. Due to the stack effect, most of this leakage occurs at the top and bottom of your home – your attic and crawlspace. Sure, there’s insulation in your attic and crawlspace. But there’s probably nothing to prevent air from moving past plumbing, air duct, and electrical penetrations. Or attic staircase hatches. Or whole house fans. In spite of all their benefits, neither fiberglass nor cellulose insulation provides an adequate air seal. While some research suggests that cellulose resists and/or blocks air movement more effectively than fiberglass, these materials are and should only be installed to reduce the passage of heat – not the passage of air. Only foam insulation and certain caulks can block air movement in a way that truly improves comfort and boosts energy efficiency. Any time you’re thinking about adding insulation to improve your home’s thermal performance, consider air sealing as part of the same project. Have your insulation contractor seal all visible gaps and cracks inside the space you’re planning to insulate. You’ll improve the overall performance of the new insulation you’re buying. You’ll also be more comfortable and save energy. Any type of insulation reduces your carbon footprint, helps you stay comfortable, and lowers your energy costs. The more of it you can get – up to a point – the better.